Situated in northwest Cambodia, within meters of the international Thai border, Holiday Palace offers a luxurious sanctuary for the discerning traveler. With a selection of restaurants and cafés that feature both casual and gourmet Asian and Western cuisine, guests are encouraged to pamper their palates and explore the extensive culinary options at the hotel. In addition, the duty free shop at the lobby offers great deals on liquors, perfumes, cigarettes and cigars. The luxury spa, hair salon and gym also provide an oasis for guests to retreat and relax in. Finally, the reverting and luxurious casino at the hotel is a place where visitors can enjoy the best gaming experience in Cambodia. Accommodation is available in several categories, from affordable rooms to large two-bedroom suites. All 388 guestrooms have been newly renovated in a warm, elegant and contemporary style, and are equipped with flat-screen LED TVs. At Holiday Palace, hospitality comes from the heart. We are uncompromising in our pursuit of excellence and committed to delivering the best in world-class service to all our guests. Room service operates 24 hours a day, and wi-fi is available throughout the property. With style and comfort to satisfy even the most astute traveler, Holiday Palace offers a comprehensive range of accommodations, from the cozy to the grandeur. Artworks from the region decorate the walls to enhance the aesthetic qualities of our rooms. Additionally, to increase connectivity and convenience for our guests, every room is equipped with broadband Internet, wi-fi and satellite channels on high quality in-room flat-screen LED TV. 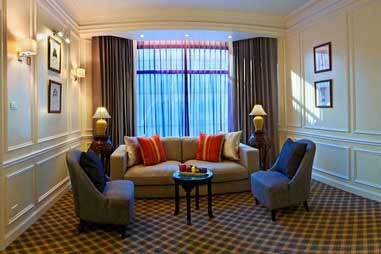 Recently launched, the Century Room is a bright contemporary guestroom that evokes a sense of calm and relaxation. The neutral bleached wood and cream tones, with sleek-lined furniture are all pleasing to the eye. Guests are invited to unwind and enjoy the flat-screen LED TV, de-stress in the en suite grey slate-tiled bathroom and utilize the working desk and accompanying lounge chair. The rooms are available in either a king- or twin-size bed. Simply put, the Century Room is the perfect option for travelers who are looking for short-term accommodation at economical prices. Step into this contemporary European décor inspired guestroom, which features a modern dark brown leather bed base and frame for either king- or twin-size bed. The tall ceilings have striking decorative cornice detailing and warm fabrics and lighting. In both the bedroom and the bathroom, the stylish design incorporates either one of two vibrant hues: navy blue or burgundy red. The sleek armchair is covered in a cool grey upholstery that mirrors the chair of the elegant in-room desk. 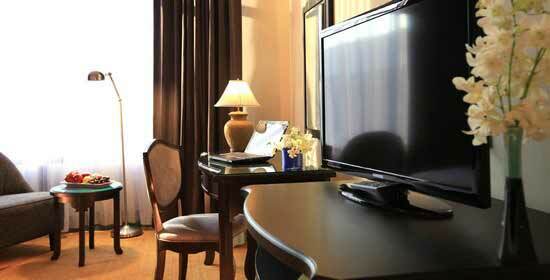 A large flat-screen LED TV is included in all of the rooms. The suite is inviting and luxurious with a spacious and classically decorated living room equipped with sofas, armchairs and flat-screen LED TV. With intricate French paneled walls, contemporary neutral colors and tasteful artworks, the suite epitomizes both sophistication and elegance. 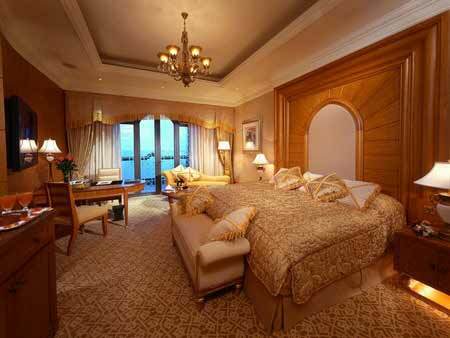 The bedroom has an impressively tall ceiling and a king-size bed. The spacious en suite bathroom is complete with a large bathtub and a separate shower, all decorated with a natural white, black and dark green marbles. For those traveling in a small group, this spacious two-bedroom suite is the most ideal choice. The twin bedroom has an en suite bathroom with shower and WC, while the connecting master bedroom with king-size bed has an additional bathtub in its en suite bathroom. 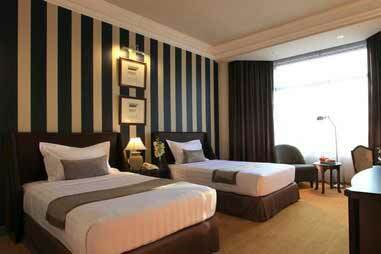 Both bedrooms have their own flat-screen LED TV set and an in-room safe. Connecting the two bedrooms is a living room, which has one comfortably cushioned three-person sofa and luxurious armchairs, all set around a mahogany coffee table. Enjoy room service at the large round glass-topped dining table. The dining area also has a convenient serving counter and refrigerator. For those in groups of three to four, this is the ultimate space that exudes luxury at all levels. Relax in a décor where European elegance meets contemporary design furniture. Walls in the airy living room are filled with opulently framed architectural prints. Enjoy a drink or snack in a comfortable living area. The dining space also includes a built-in bar counter and large kitchenette with refrigerator, which provides the perfect venue for in-room entertaining. One twin bedroom has an en suite with shower and WC, while the connecting master bedroom, with king-size bed has an additional bath in its en suite bathroom. 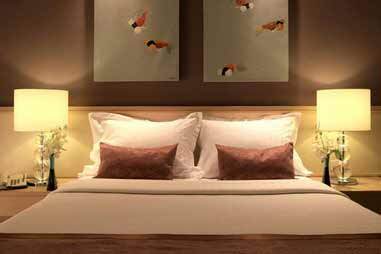 Both bedrooms have their own flat-screen LED TV set and an in-room safe.